When I decided – truly committed myself – to writing The 8 Essential Skills there was a lot I didn’t know. I knew my subject well. After all, I’ve been a supervisor, a manager, a director, and a business owner. I’ve also taught, coached, counseled, and advised people in those positions for two decades. So I knew a lot about how to build and run an organization. And sure learned quite a few things that definitely didn’t work while I was at it. What I didn’t know was much about what it takes to write this kind of book. 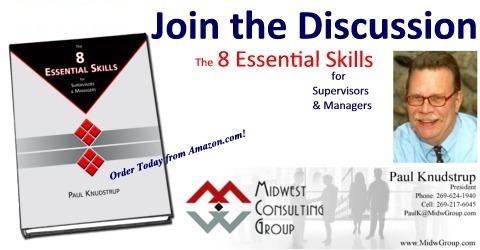 I’d written a lot in developing and creating supervision and management courses for organizations of all kinds, and I’d taught literally thousands of hours. But how much it would take to turn everything into a usable book was a mystery to me. What would you think . . . did I underestimate the amount of time? Or, did I overestimate how long it would take. What’s your guess? Of course . . . I thought it would take “a few” months to gather all my notes, download all the stuff I’d been thinking about and review all the writing I’d done on the whole management and leadership field . . . how long could that take, anyway? Ha. Although I’d been “planning to” write a book for the past five years, the commitment to write the book became firm in early 2009 when it became apparent that the “temporary” freeze on most training and staff development courses was going to be lengthly. As the U.S. economy and then most of the rest of the developed world decended into the Great Recession, the book began to assert itself.